In goes a pot roast and vege­tables for 4 to 8 people. or 7 o'clock or even at midnight . J 0 minutes of gas in the evening start prunes and oatmeal for the following breakfast. All cooking on retained heat pro­duces superb flavor. Sleep late and enjoy a hot breakfast. 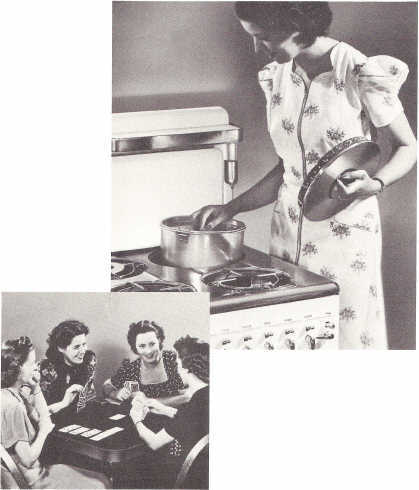 THE Thermowell becomes an indispensable unit to the busy housewife who does her own cooking, especially if the family is small. Small pieces of meat can be cooked in the Thermowell with 15 to 20 minutes of gas, and the family will never know that the meat has not been cooked in the oven. Approximately 10 minutes of gas for each hour of cooking does the job. The gas is burned all at once, at the start, and watching ends thereafter. Consult the Thermo­ well time chart for examples of time and gas savings. This unit is especially salable to business women who want to start the evening meal at breakfast time.